Break free from your typical road trip course and go trekking off the beaten roadway commanding the wheel of Toyota’s reinvented longer and wider RAV4. When future buyers who like to schedule weekend excursions and surround themselves in nature stroll through the doors of Westbury Toyota in Westbury NY, we cannot wait to go over with them the numerous improvements that turned RAV4 into the ultimate compact crossover for memorable moments outdoors. 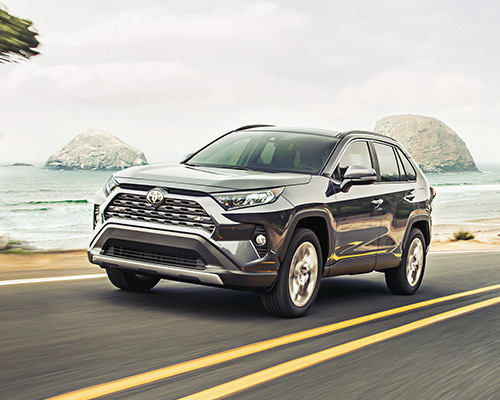 Toyota realizes how much of a distinction those smaller finishing touches make in differentiating sport utility vehicles (SUVs) from the other, which is exactly why the refreshed RAV4’s exterior emphasizes eye-catching design components. New chiseled curves, refashioned LED headlights and taillights, dual chrome exhaust tips, and a rear spoiler make sure you do not get overlooked in traffic. Each RAV4 model is outfitted with specific wheels to accentuate its distinct style, too. 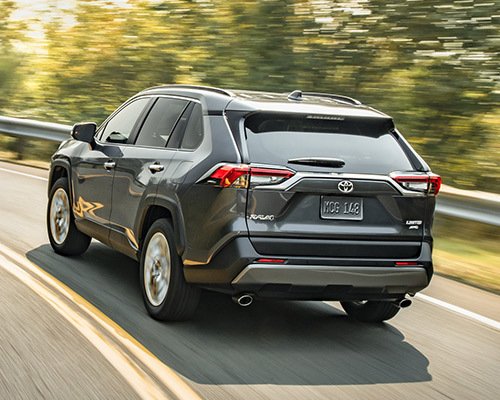 Toyota RAV4 achieves optimum performance and greater fuel efficiency with its 203-horsepower (hp), four-cylinder, 2.5-liter (L) inline engine and Direct Shift eight-speed Electronically Controlled Automatic Transmission. Smooth operating is created through the multi-link rear suspension and body rigidity working together to boost control. Additionally, RAV4 offers you the selections of Normal Mode, Sport Mode, and ECO Mode for your ideal manner of driving based upon the circumstances. Obtainable Dynamic Torque Vectoring All-Wheel Drive (TV-AWD) delivers outstanding traction by transferring a max of 50 percent of the motor's force to the rear wheels and which one calls for more stability. If you just need the front wheels in motion, electronic Rear Driveline Disconnect ceases the AWD process. You can also rotate the dial for obtainable Multi-Terrain Select to switch between Mud and Sand, Rock and Dirt, or Snow and have wheelspin promptly corrected. Gear up to experience expeditions beyond the boundaries of asphalt lanes in Westbury driving the RAV4 XLE. Vacations take on a tremendously different point of view with this SUV containing a Smart Key System, integrated fog lights, five USB ports, and dual zone automatic climate control. Following in the footsteps of Toyota’s off-road history, RAV4 Adventure revolves around looking tough with 19-inch (in.) split five-spoke alloy wheels, an uncommon split-bar front upper grille, grade-limited roof rails, and black badging. Orange stitching and accents, anti-slip door grips, and embossed seat inserts express that same sporty persona on the inside for a one-of-a-kind style. Comfort on the way to your spot for roughing it go hand in hand with Limited’s eight-way power-amendable driver's seat, heated front chairs, and power-tilt moonroof. Stylish exterior traits comprise a Dark Gray metallic-tinted front grille in hexagon pattern, chrome-accented door handles with touch sensors, and puddle lights. Intend to transport a few chums and tons of gear with you on your future excursions? RAV4 has 60/40-split seating in the second row you can fold down for as much as 73.4 cubic-feet (cu.-ft.) of storage room, making storing and accessing items considerably simpler. And, towing limitations range from 1,500 pounds (lbs.) on basic models to Adventure towing an ample 3,500 lbs. With the Smart Key fob in your possession, you can automatically open and close the available power liftgate via pushing a button or touching the handle. If you do not have an empty hand, Limited has the handy incorporated function of swinging your foot under the rear-bumper’s middle to prompt opening the liftgate. Avert belongings from shifting around excessively on the ride, as well, using the accessible cargo net hammock that is pliable enough to configure many ways. You will have the capability to get ready for thrilling trips in no time at all! Temperature is another modifiable property of RAV4 with the possibilities to heat and fine-tune front seats at different levels, press open the power-tilt moonroof, and slide the sunshade. What about operating your smartphone, playing songs, and charting a route? After linking an iPhone to Siri Eyes Free, simply use spoken words to fulfill commands, such as making a phone call, sending text messages, and controlling the playlist, without taking your fingers off the steering wheel. In addition, Entune Audio touch-screen monitors display every one of the services you can access. What happens on the street is equally as unforeseeable as when terrible things will occur in life. Fortunately, RAV4, named IIHS Top Safety Pick (LED headlights required), is well-equipped to safeguard you and your loved ones. This SUV contains eight standard airbags, a bundle of six advanced safety tools, and optional assistances you can opt for that include Blind Spot Monitor (BSM) for shifting lanes and Rear Cross-Traffic Alert (RCTA) for going in reverse in a safer method. Toyota also provides 24-hour roadside assistance for two years. 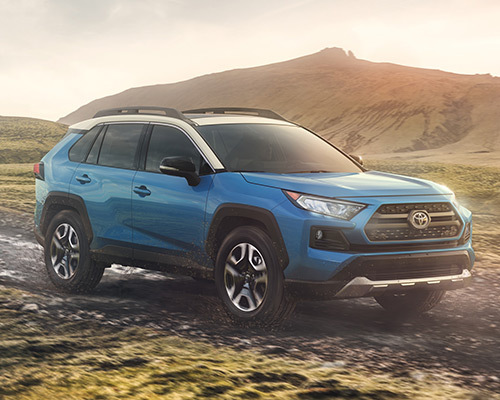 The radically renovated RAV4 built with numerous cutting-edge amenities is raring to help make your off-road expeditions better than you ever envisioned. Test drive the RAV4 at Westbury Toyota in Westbury and buy or lease the model that interests you today. Hidden land is summoning you.